Portable SecureCRT is a customizable Windows terminal emulator with built-in support for Secure Shell (SSH), Telnet, rlogin, serial and TAPI protocols, providing encrypted login, data transfer and terminal sessions. Portable SecureCRT was designed as an easy to use solution, suitable for network management, business, development tasks and information security. Through its solid terminal emulation with powerful encryption, SSH data integrity and broad authentication options, Portable SecureCRT provides reliable protection for user accounts, passwords and data. 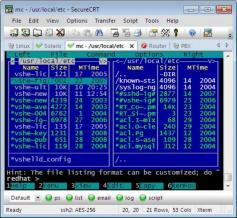 - Support is enabled for SSH1, SSH2, Telnet, Telnet/SSL, Rlogin, TAPI and Serial protocols. - Supported authentication using password, public key, X.509 certificates and Kerberos v5 via GSSAPI. - The script recorder enables you to quickly create a script to automate routines. - The “Use auto session” function allows you to select a single session, multiple sessions or folders of session to connect on startup automatically. - Passwords can be shared by Portable SecureCRT and SecureFX while either of them or the Activator utility is running. - SSH2 session passwords can be cached like passphrases. - Color schemes can be selected to replace the standard white foreground/black background when using ANSI color. - Custom log data provides expanded logging options by allowing you to specify strings to be logged upon connect, disconnect and on each line. - Support is enabled for parameter substitutions for date and session. - OpenSSH support lets you generate keys in OpenSSH format or convert existing private keys in VanDyke Software format to OpenSSH format. - The list of tabs on the menu can be displayed using the MENU_TAB_LIST1 custom menu item.